Quitting Smoking: It’s Never Too Late! Do you have a senior loved one who smokes? Smoking is less common among seniors than younger age groups, but you might be surprised to learn that in Canada, 11% of men and 9% of women over 65 use tobacco daily or occasionally. Nicotine is highly addictive, and withdrawal symptoms are challenging to cope with. Quitting smoking is challenging for people of any age, but for seniors it often means trying to stop a habit that they’ve had for decades. The good news is that no matter how long they’ve been smoking, people who quit can experience health benefits within hours of their last cigarette. Let’s look at the reasons why it’s great to be a “quitter,” and explore the resources available for smoking cessation. There is no doubt that smoking is a dangerous activity. It’s a risk factor for a wide range of health problems, including heart disease, stroke, lung cancer and chronic respiratory disease. In Canada, smoking (or tobacco use) is the leading risk factor for disability and premature death, responsible for 45,000 deaths per year. According to the Ontario Dental Association, smoking is also linked to many oral health problems, including oral cancer, gum disease, slower healing after oral surgery, stained teeth and bad breath. Smoking is also linked to eye problems (age-related macular degeneration, cataracts and glaucoma), slower healing from surgical procedures, insomnia and reduced bone density. Why is tobacco smoke so harmful? It contains thousands of chemicals; more than 70 of them are known carcinogens (chemicals that cause or promote cancer). Second-hand smoke is also hazardous to health, as are mini-size cigarettes, cigarillos, smokeless tobacco products, tobacco-free herbal cigarettes, discount cigarettes and contraband cigarettes. It’s best to avoid tobacco products altogether! Within eight hours, the level of carbon monoxide in the body decreases, and the oxygen level returns to normal. After 48 hours, the risk of heart attack starts to decrease, and the senses of taste and smell – which can be dulled by smoking – start to improve. At 72 hours, lung capacity increases and breathing is easier. From two weeks to three months of being smoke-free, lung function increases up to 30% and blood circulation gets better. At six months, there is improvement in the coughing, tiredness, shortness of breath and stuffiness caused by smoking. At the one-year mark, the risk of smoking-related heart attack drops by half. 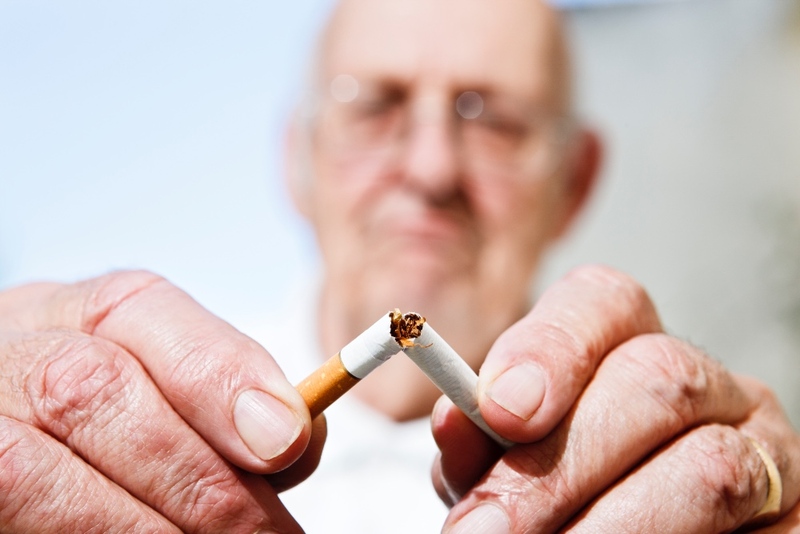 The health benefits continue to increase the longer a person is smoke-free. Quitting smoking is very difficult – many people attempt it 30 times or more before they are successful. Many quitters find it helpful to make a plan. Experts recommend choosing a “quit day” in the near future that the smoker thinks is realistic. The sooner, the better, but it might help for someone to quit on the first day of the next month, on a meaningful date, or at a time when stress will be low, for example. It also helps to keep in mind positive reasons for quitting – whatever is meaningful for your loved one. To increase the chances of success, quitters can also avoid situations and environments where smoking is present; build a support network of friends and family; seek advice from a physician; and take advantage of free smoking cessation resources such as websites and help lines (see “Additional resources,” below). Many quitters find it helpful to use nicotine replacement therapy, such as nicotine gum, patches, lozenges or inhalers, to reduce their cravings and other withdrawal symptoms. Some people reduce their smoking by switching from cigarettes to vaping (also known as e-cigarettes), which contains less nicotine and is less harmful than smoking because no burning of tobacco is involved. Withdrawal symptoms, which are strongest in the first four to five days after quitting, can include irritability, sleepiness, low energy, dizziness, cold symptoms, hunger, lack of focus, cravings, headaches, restlessness and more. Some symptoms can linger for a few weeks. Withdrawal symptoms are different for each quitter, and it’s important to find ways to cope. For example, for quitters who feel the urge to smoke, the Lung Association recommends drinking water to help remove nicotine from the body faster; deep, slow breathing; delaying the next cigarette with the hope that the craving will pass; or doing another activity, such as going outdoors or calling a friend. If your loved one is not successful the first few times they try to quit, be patient and supportive, and try to keep them motivated. Together, you can look forward to a smoke-free future. This resource from The Lung Association provides information on quitting smoking, including how counselling, medications and other supports can help people succeed. Access your province’s or territory’s online quit-smoking resources, or call 1-866-366-3667 toll-free. This free, confidential and personalized service from the Canadian Cancer Society provides support (phone, text messaging or online) to smokers who wish to quit. This website from Johnson & Johnson Inc. offers tools and success stories for first-time quitters and people who have tried to quit before.